He won America’s Got Talent. Now he stars in his own show at Planet Hollywood. But before almost two years before the fame, he appeared on this very program. Talk For Two is proud to welcome BACK, Paul Zerdin! The AGT season 10 winner sat down with Matt before taking the stage in Ridgefield, Connecticut at the Ridgefield Playhouse. 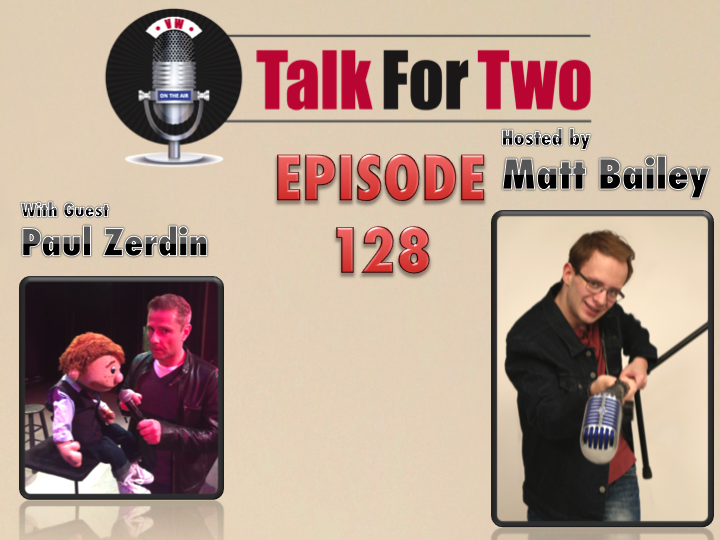 The pair talk everything from his whirlwind run on the NBC to how Zerdin manages his crazy international schedule. This interview-which took place in March of 2016-also serves as a peak into his then-developing Las Vegas residency. Now running at Planet Hollywood, Paul Zerdin: Mouthing Off is expected to run for at least three years. Get your tickets to Mouthing Off by clicking here, and remember to tune into NBC on Mondays and Tuesdays to catch season 11 of America’s Got Talent. It’s time to celebrate the Year of the Sponge!